After becoming disenchanted with my Fiskars trimmer, I switched to a CM trimmer which was much more accurate. However, at the same time I bought CM's little 6" guillotine and loved it so much I started looking for a 12". CM didn't make one (they should consider doing so) and the prices of the office equipment type were startling. Then I saw an ad for the 2-in-1 in a magazine. Finding one I could actually look at, however, was a problem. While on vacation I ran into a lady who was closing her store and while I was looking around at the bargains my hubby spotted the Purple Cow I had been looking for. The store did not carry them but had one for use in their classes and crops. After examining the trimmer and talking to the owner, I ordered one upon my return home and started using it immediately upon receipt. Several months later I noticed that the plastic housing that covers the screw and nut that hold the arm to the body was cracked. I called the phone number on the brochure that had come with the trimmer. I was treated very nicely by the young woman who answered the phone. After explaining the problem, she said they would send me a new one the very next day. I had it in less than a week and then boxed up the old one and mailed it back. I was never without the use of the trimmer and the company was very good about the exchange. No one could ask for better customer service. 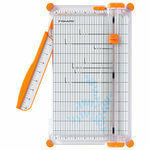 Please note that this is not an ordinary guillotine type paper cutter. There is no cutting blade on the arm. In order for the cutter to cleanly shear off the edge of your paper, you MUST press down on the "lever" (for lack of a better term) right next to the arm and hold it firmly when you bring the arm down. There is NO blade to get dull. The paper is cut cleanly and accurately by virtue of the shearing action of the arm against the body. This will prevent you or your kids from cutting fingers, although it is possible to get a painful pinch if you don't use it properly. I have found the measurements to be accurate and my cuts are straight. I had never used a rotary trimmer before but have found this very useful for making attractive embellishment strips for borders and such. I am thinking seriously about getting some of the new blades they are now making for it. Holy Cow! I love this trimmer! It was time for me to trash the old paper trimmer & invest in a new one. I did my homework & researched all the trimmers out there. It arrived quickly (thanks scrapbook.com!). 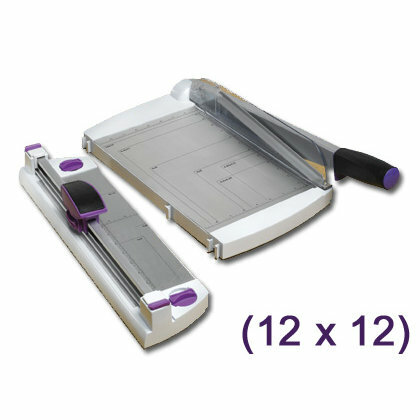 The manual provides the lowdown on the trimmer, which I sugges reading before using it because there are a few safety features that make it a little tricky to use for the novice Purple Cow Paper Trimmer user. I LOVE that it snaps together & sits on my scrap desk as one piece. And because it separates into two trimmers, I can take the smaller side to scrap with friends. It takes some getting used to when trying to align papers if you are used to another cutting system. I would suggest making practice cuts on unwanted photos till you get the hang of it. And I have found that it is much easier to stand up when using the rotary blade. This allows you to apply more pressure when making your cut. All in all, I'd have to say I am VERY pleased with my Purple Cow. My husband got me this trimmer last Christmas and I love it! I love the fact that it's heavy duty. I use it almost everytime I scrap and I have yet to need to replace a blade in it. I love the fact that it has interchangeable blades on the rotary half of the trimmer. If you want to have a wavy cute, straight cut, or perpherated cut, you can with this machine. One of the coolest things about it is that you can separate the two trimmers. I highly recommend this trimmer for all scrappers! It is a must have!! I am so glad I spent the money & bought this. I was skeptical at first, but this works great. If you have a get together you can break it apart, so you have 2 cutting boards. I wasn't sure how well it would cuts photo's, especially since you can touch the blade and it feels dull. But it works like a champ. You don't have to worry about your kids getting injured on the blade. 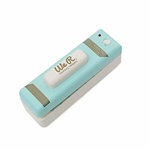 I didn't know when I bough this, the the sliding trimmer also has changeable blades, so that you can make wavy cuts too. This is a must have tool! 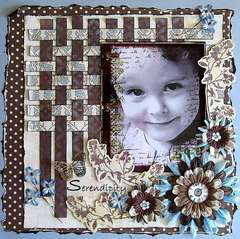 And how I love my scrapping tools! This is my favorite product because of it's versatility. It weighs next to nothing and cuts perfect everytime! You can go thru 10 papers at once with the guillotine cutter side or use the rotary for precision cuts, making paper strips to go thru stickermakers and diecut machines or choose a different blade type for wavy cuts and perforated pages. This company just came out with a whole bunch of fun blade styles that you can purchase seperately, my favorite is the stamp blade. 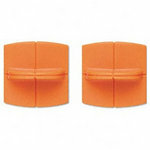 Than when you are headed to a crop you simply unsnap the two cutters and now your rotary cutter can be taken with you. Most quality paper cutters cost too much and are really heavy allowing for only table use. 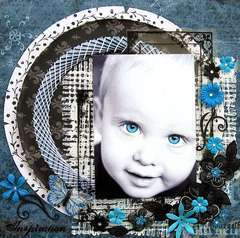 This one costs less and does more a definate must have! I bought this trimmer and the 12 additional rotary blades that are decorative. I love them both! Not only does it eliminate the individual decorative scissors that I used to own (15 of them), and it frees up some of my storage space but this trimmer is an all in one! 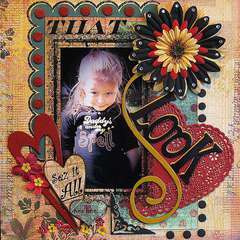 It cuts up to 12x12 paper or you can change the rotary blades and make different decorative edes, score paper,perforate it, etc. 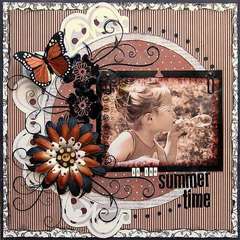 Great for scrapbooking and card making. 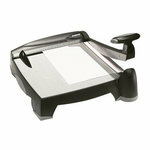 Plus, the bonus is you can separate the paper trimmer from the guillotine trimmer for going to crops! There is a lock for both sides as well so there are no unexpected injuries! What more do you need? 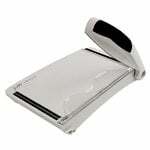 One reviewer said that the guillotine blade seemed to be getting a little dull.....to fix that, take some aluminum foil and cut it with the trimmer. It will sharpen the blade in no time. It also works for punches. Or cut wax paper if they start to stick! 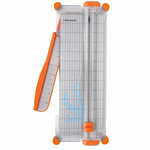 If you need a paper trimmer, I highly recommend this one and the additional ratory blade set available! Best Paper Trimmer I have tried! I decided to buy this trimmer because I have been wanting a guilotine trimmer for some time, but was afraid to get one cause of my small kids and their need to touch things even when I tell them not to. I read the reveiws on this and was very intrigued by people commenting on how safe the blade is. I was skeptical about how well it would cut, but I have been so pleased with the way it performs! The blade is not sharp--small fingers could get pinched, but not cut, and yet it cuts like a dream! I also love the versatility of having 2 trimmers in 1, or being able to take them apart just to make them more portable. I have been searching for my perfect trimmer for awhile now, and I think I have finally found it! The interchangeable blades of this rotary cutter make it a lot of fun to use, and I love all the safety features that are built into this product! I also like that you can attach the rotary cutter part to the blade section, or keep it separate for better portability. The blade cutter isn't the best I've seen, but it is functional for the paper I have tried. 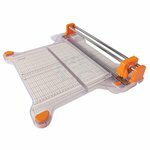 I would buy the product for the rotary feature, not the standard paper cutter section! I love this trimmer. I just got it and was looking for a trimmer for cutting different edges (wave,etc.). I looked at another one that was a bit cheaper and read reviews on it and feel in love with this one... I love that the blades are so easy to change.. 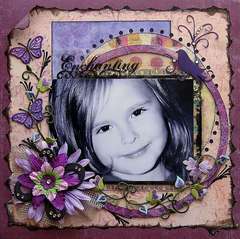 It's great that there are two parts to this-love being able to just take the different edges to get a look! highly recommend this awesome product! !